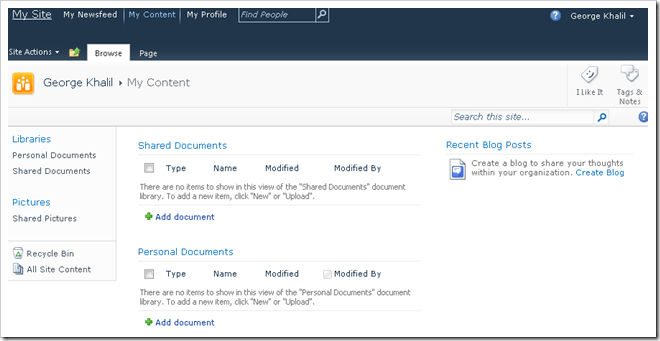 SharePoint My Sites are commonly referred to as “Facebook for the enterprise” and are personal site collections providing each user with the ability to store private and public information such as documents, pictures, status updates, etc easily and efficiently. 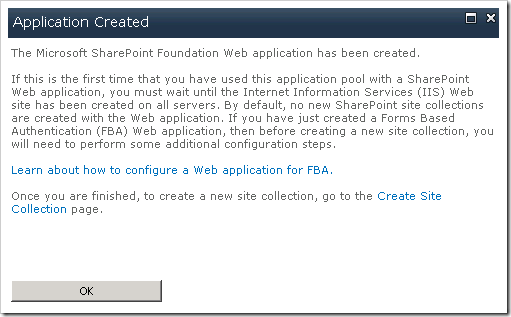 My Sites in SharePoint 2010 takes social enterprise computing to the next level and builds upon what we have come to love in previous versions. Microsoft saw the need to continue to invest and enhance SharePoint’s social networking capabilities, and as web 2.0 technologies continue to sprawl all over the world wide web, Microsoft have again successfully set the bench mark in the enterprise by introducing an array of social computing features to enhance end user collaboration in SharePoint 2010. We begin by first creating a Web Application that will eventually house our My Site Host and subsequent site collections. Authentication Provider: Select your preferred provider based on your requirements. 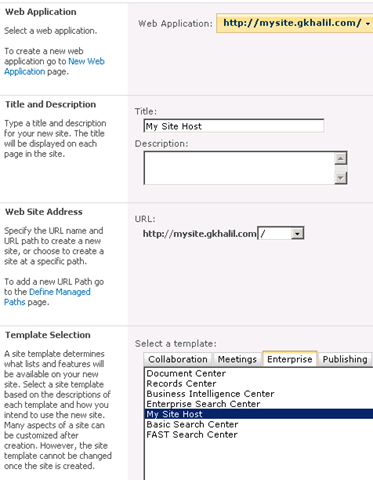 Public URL: Specify the URL that users will type to access their My Sites. 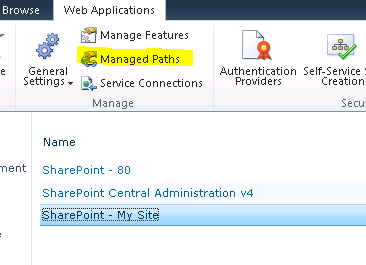 As we have been utilizing the least privilege model whilst configuring our SharePoint farm in this series, we will click on Register a new managed account and enter the details for our My Site Application Pool Identity. 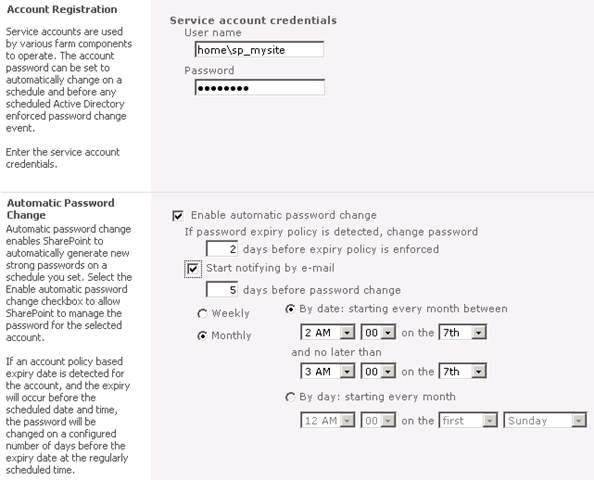 Note: This account will be required to be provisioned in Active Directory before you can proceed. e.g. In my example I have created an account called DOMAIN\sp_mysite. 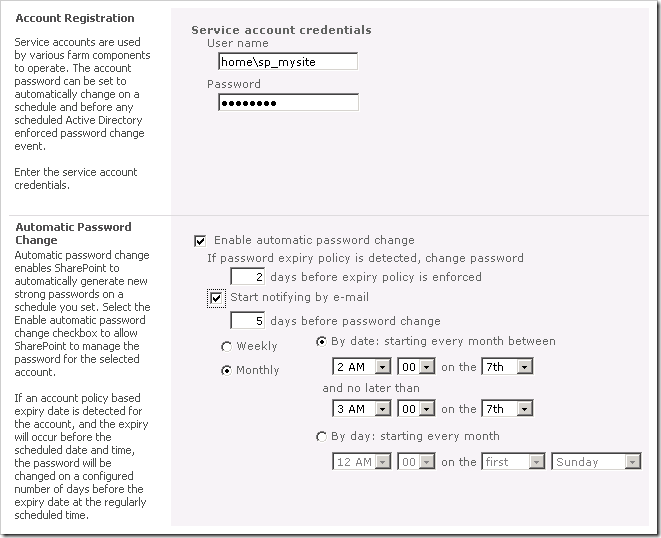 Database Name and Authentication: Specify your Database server and Database name. 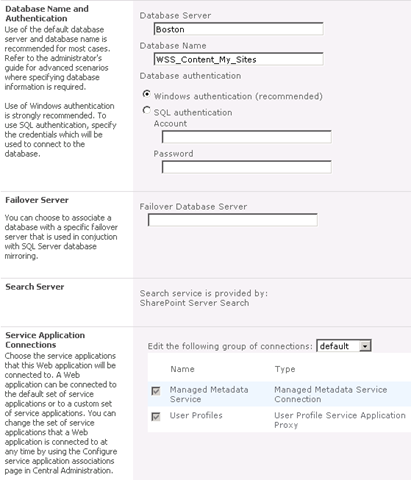 Failover Server: Specify your failover server if you are utilising SQL Server database mirroring. 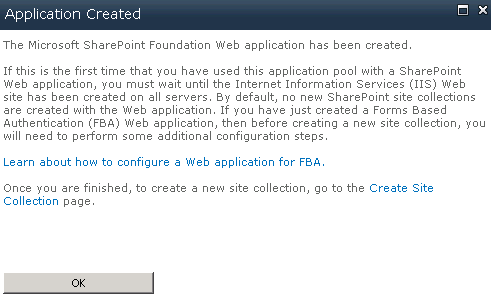 You should receive the below confirmation that the Web Application has been successfully created. 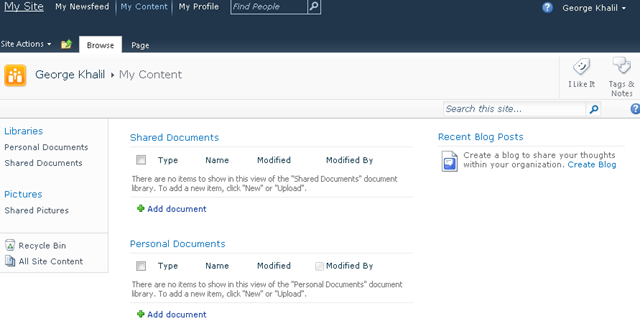 Click on our newly created “SharePoint – My Site” Web Application and click on General Settings. 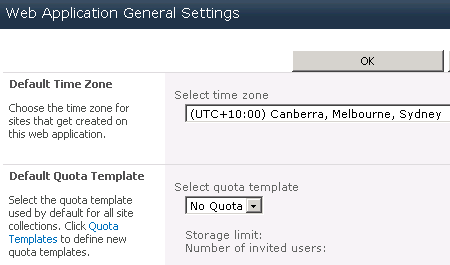 Proceed to fill out your Web Application specific settings such as the Default Time Zone etc. Now that we have successfully created our My Site Web Application, we can now proceed to create our My Site Host Site Collection. This will be the top level site that will house our individual user’s site collections. 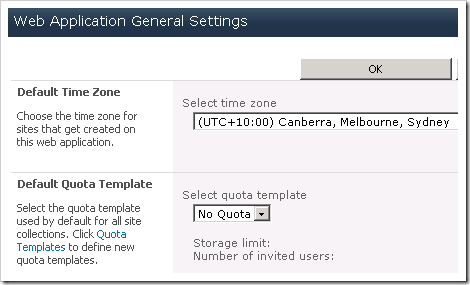 Navigate to Central Administration / Application Management / Create site collections. 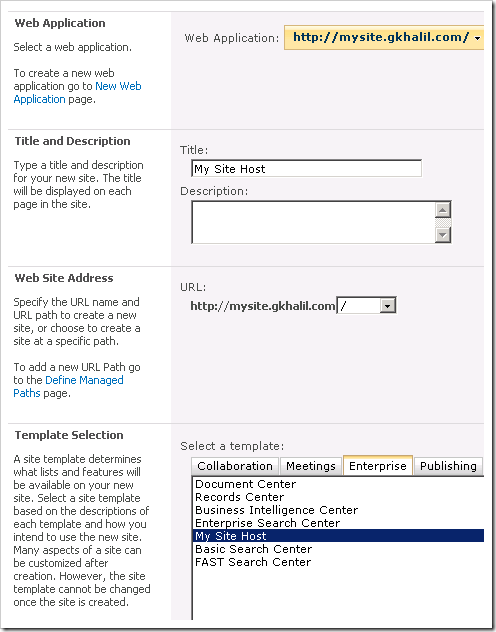 Ensure that the recently created My Site Web Application is selected, enter in a Title and click select the My Site Host Template located under the Enterprise Tab. 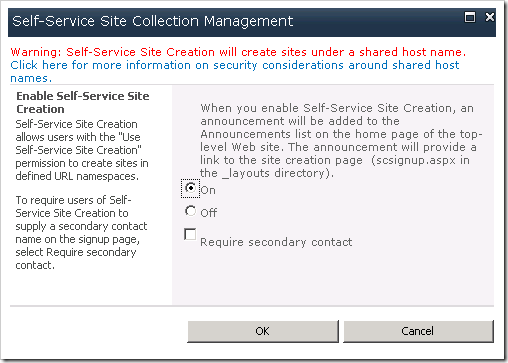 Lastly, specify your site collection administrators and click OK.
You should then receive confirmation that the top level My Site Host has been successfully created. 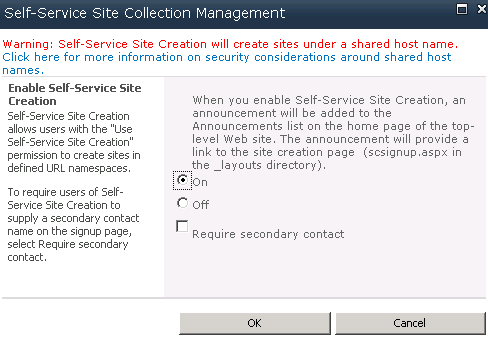 Now that we have successfully provisioned our My Site Web Application and Top Level Site Collection that will host our My Sites, we can continue to configure our My Site Settings. 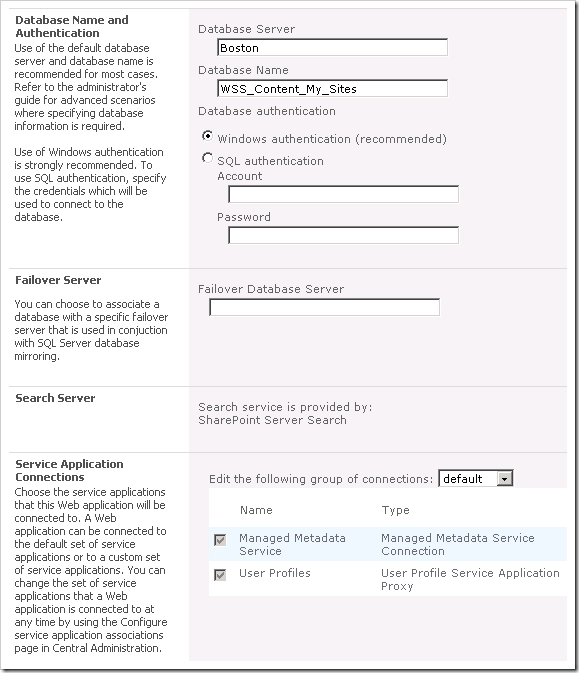 Navigate to Central Administration / Application Management / Manage service applications. Click on Setup My Sites located under My Site Settings. Enter the details of your Preferred Search Center if you have one setup already. 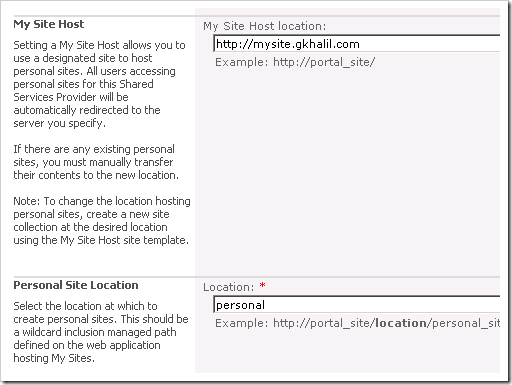 Enter the URL of your My Site Host that we have just created in the previous step and the personal site location. 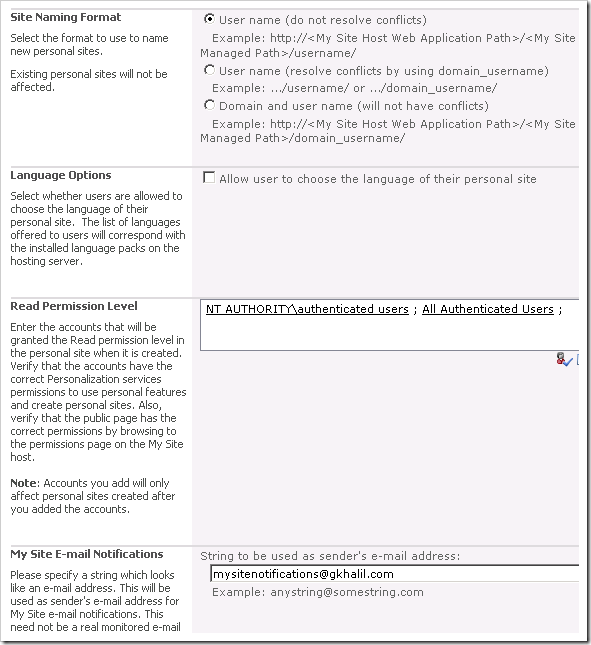 Finally, select your Site Naming format, configure your Language Options, Permissions and My Site Email Notifications. 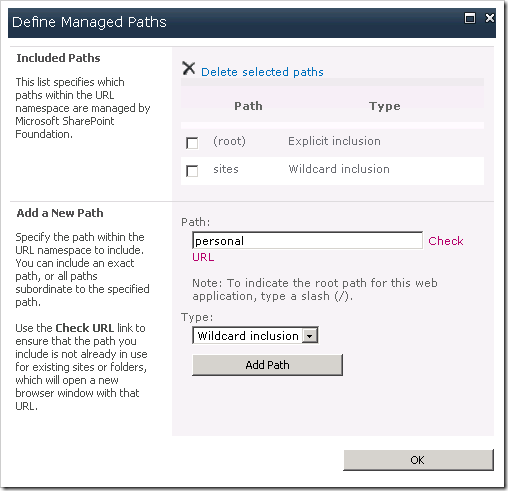 Because we have specified “personal” as our Personal Site Location, we will need to define our managed path against our My Site Web Application. 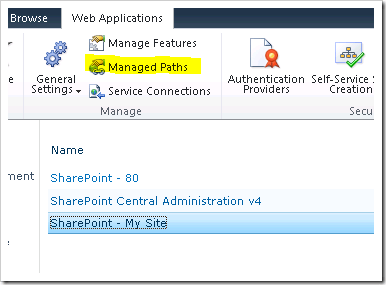 Navigate to Central Administration / Application Management / Manage Web Applications. 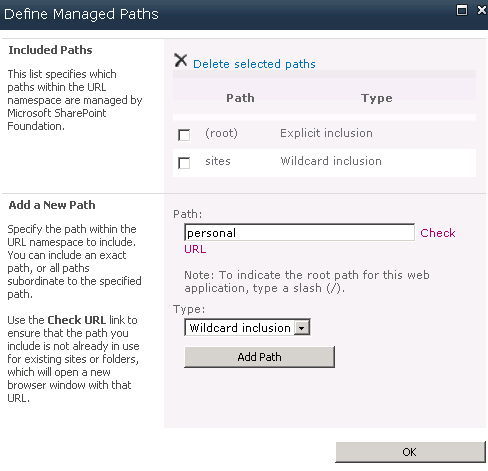 Click on your My Site Web Application and click on Managed Paths from the Ribbon. 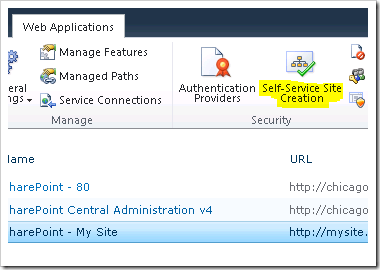 Our last configuration step provides our users with the privilege to provision their own My Site’s by enabling the Self-Service Creation. 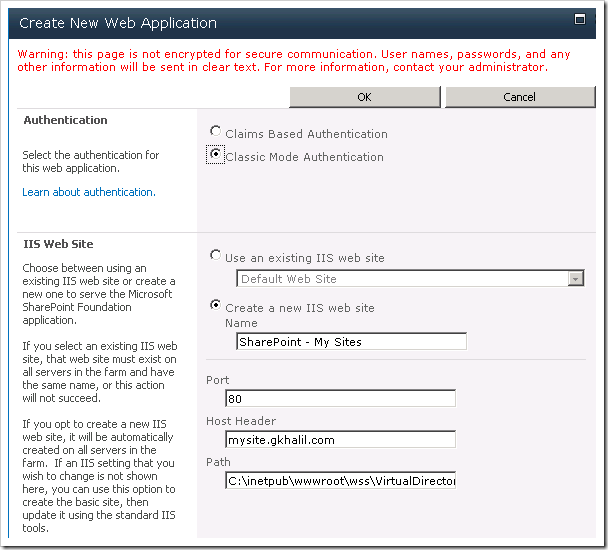 Navigate back to Central Administration / Application Management / Manage Web Applications. 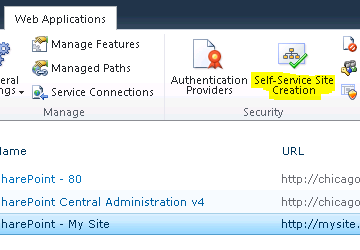 Click on your My Site Web Application and click on Self-Service Site Creation. Select On and click OK. If I now browse to my My Site URL I will be presented with the following “What’s New” Page. 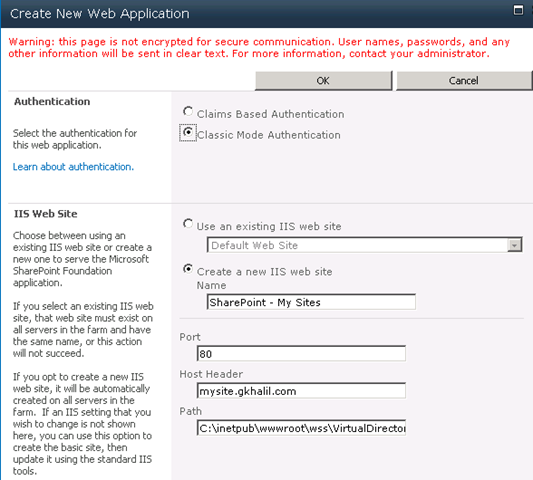 It is only until I click on “My Content”, that SharePoint will proceed to create my personal site as per SharePoint 2007. As you can see, we have now successfully completed our setup of a My Site Host which will house our user’s My Sites.